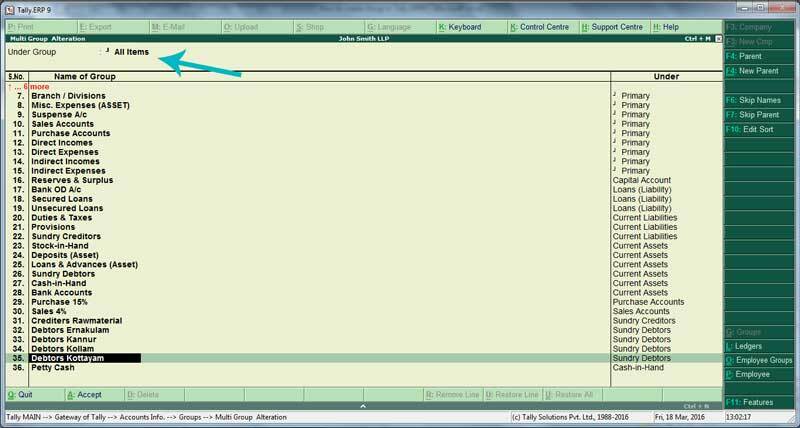 Home Masters Multiple Group in Tally ERP –Create,Edit. Multiple group is a group creation Tool Where you can create unlimited groups in a single screen.This aims speeding up of data entry in Large data handling companies. If you want to create big number of groups under a Main Group, or even you can create Multiple groups under different Main group using this option. For Example Consider this Table. In this Table,You can see All the groups are under a single Main Group ‘Sundry Debtors’. We want to create , New debtors group based on its locality under Main groupSundry Debtors. Select the Menu and Press Enter. Under Group : Sundry Debtors. Name of Group: Type the new Group name Press enter enter second name and so on. See the screenshot below. 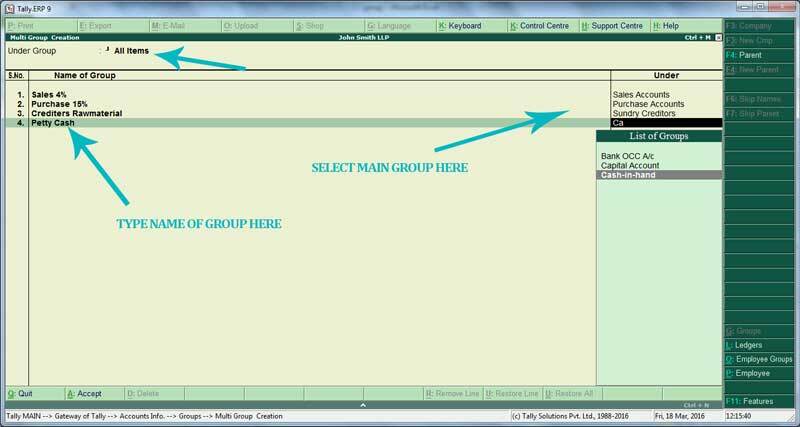 You can enter unlimited Number of Groups under a single main group. Press Enter and save. You have Created all groups under a single main group. Now Lets Look at the Second Table. In Group Creation Screen Select “All Item’ in Under Group. Name Of Group : Type All names described in the table. Under :Choose the Main group falls under each new group creating. How to Modify or Edit Multiple Group ? Lets Change the name of Group ‘Debtors Trivandrum’ to ‘Debtors Kannur’. Under Group: Choose Sundry Debtors as we are altering Debtors Trivandrum Groups under Sundry Debtor. If you Select All Item in Under group, you will Have all Groups including Primary Groups. 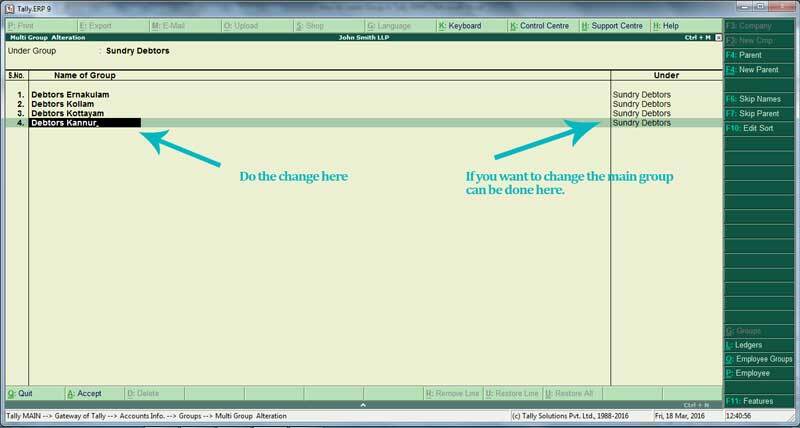 Here also You can make changes .Save the screen after making necessary changes. 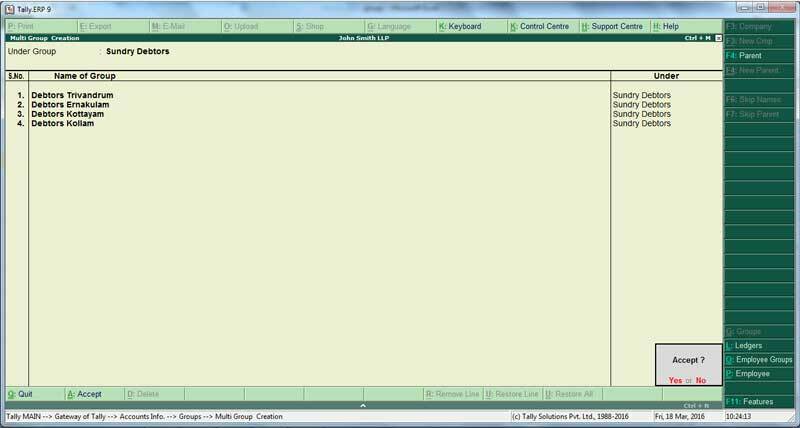 Group cannot be deleted in Multiple Group Alteration screen. 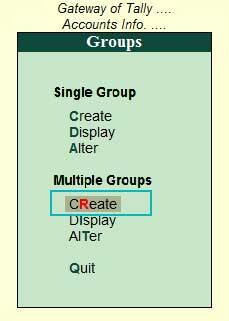 To delete a group you have to use Single Group Alteration option.